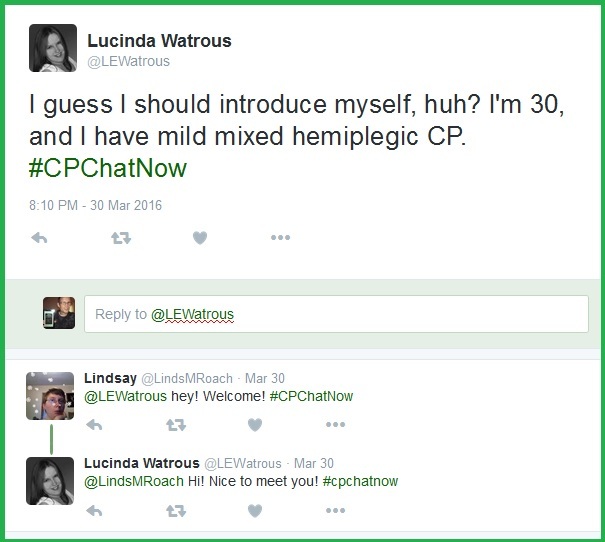 Every week the live cerebral palsy Twitter chat #CPChatNow demonstrates our community’s multi-faceted nature. Hi, co-host Zachary Fenell here to dissect what that means. 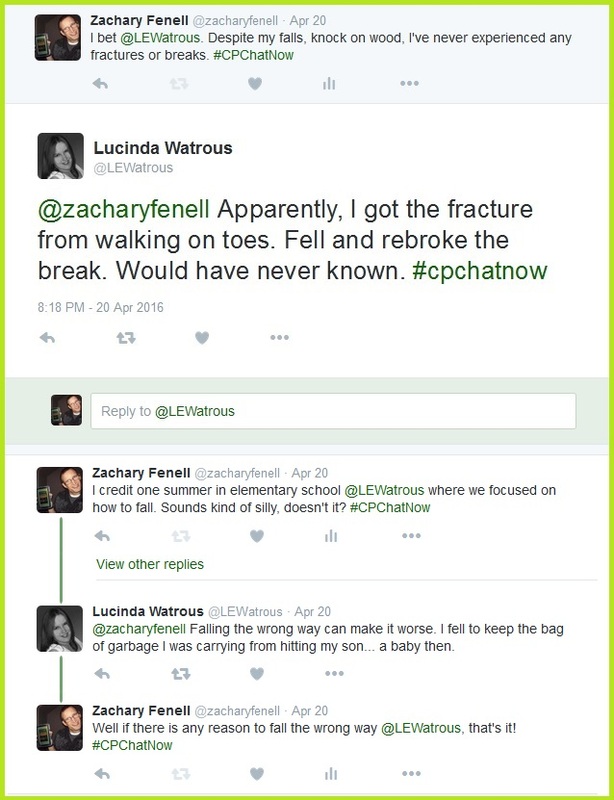 Allow me to do so by recapping the April 20th Twitter chat. 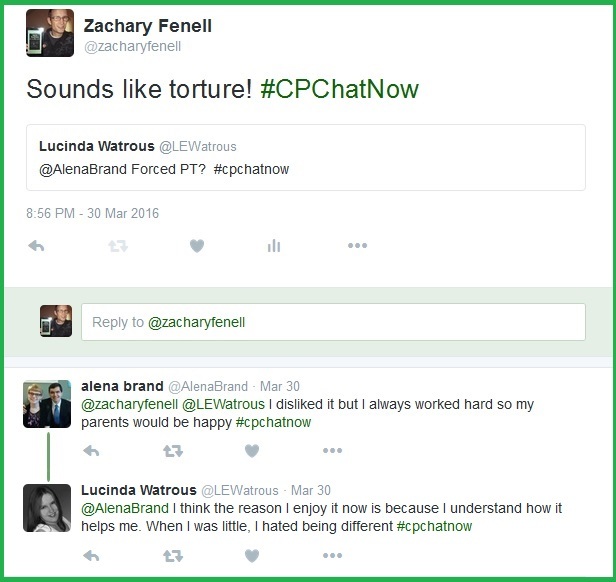 When I tell someone about #CPChatNow, I use the phrase “online support group for those with cerebral palsy.” The way we provide support proves multi-faceted. 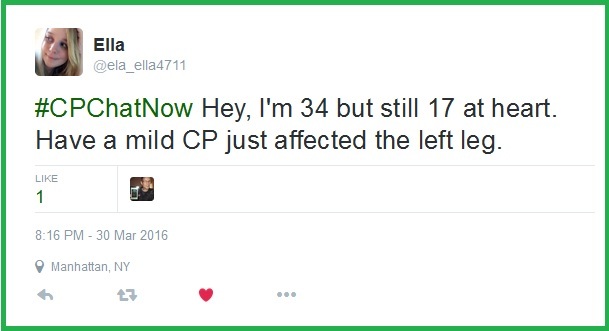 We offer an open forum to ask questions and better understand CP. Plus we work as a problem solving think tank. 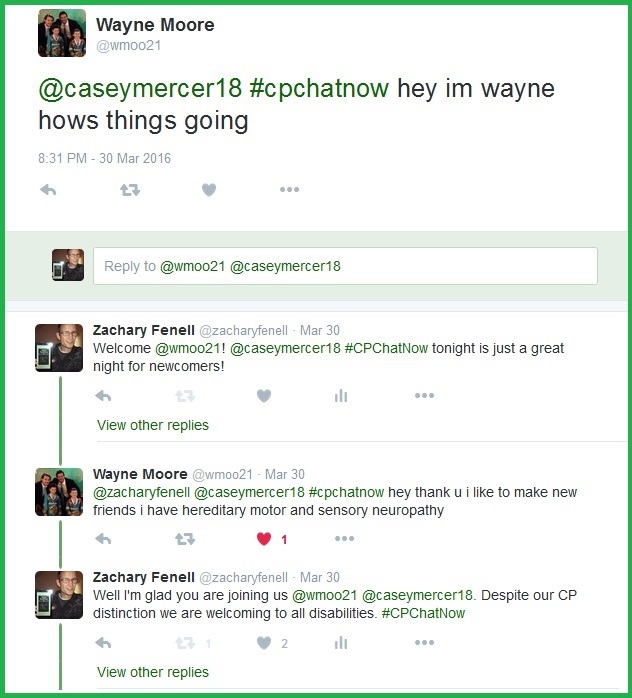 Then the weekly Twitter chat also supplies a chance to bond over cerebral palsy related commonalities! 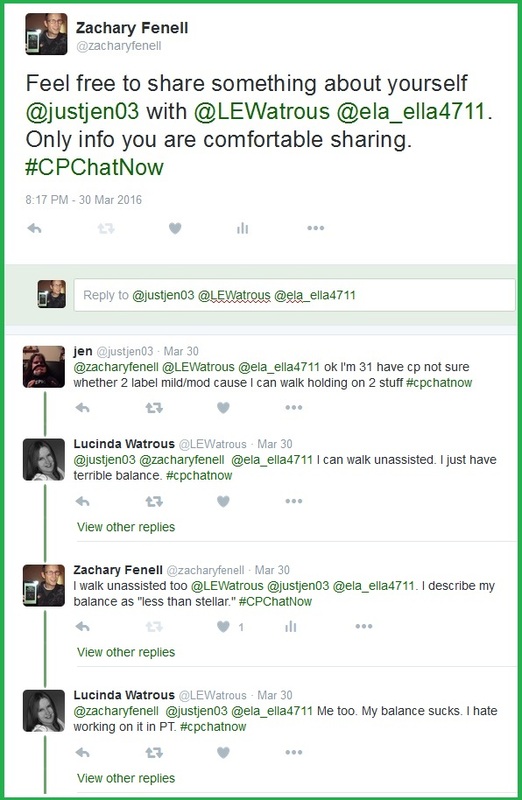 Personally I want as many people possible to enjoy #CPChatNow’s supports. Hence I started the extend-the-conversation question. You do not need Twitter or any social media to participate! Simply read the recap and leave a comment to answer the week’s question. This time around answer the following. 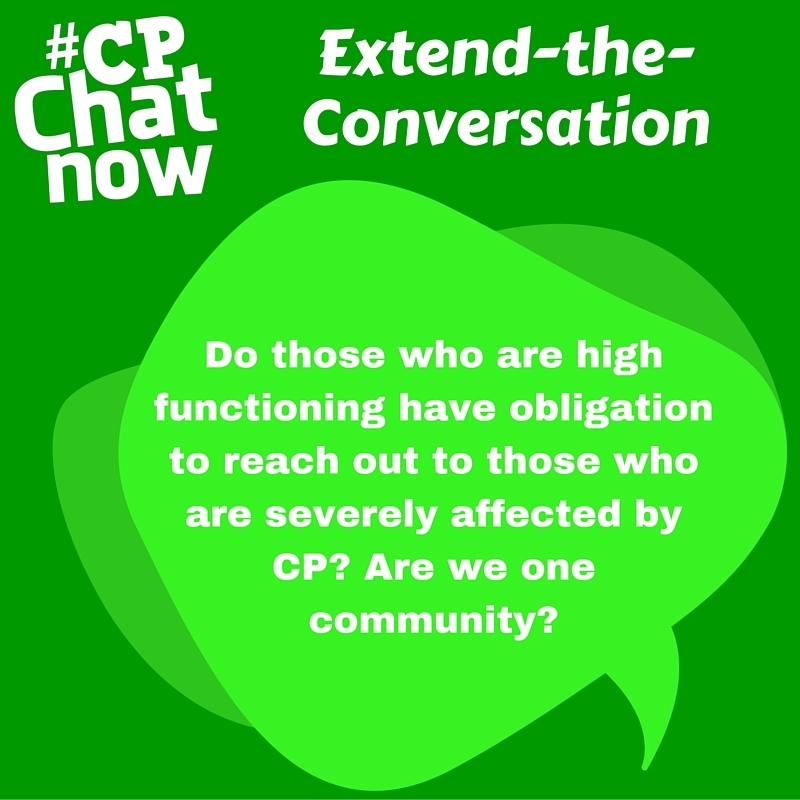 Moving on, our multi-faceted supports leaves community members holding #CPChatNow in high regards. Even to the point where internationally people partake at crazy hours! Come experience our incredible community for yourself! We give you the opportunity every Wednesday at 8pm ET. Join us on Facebook too. 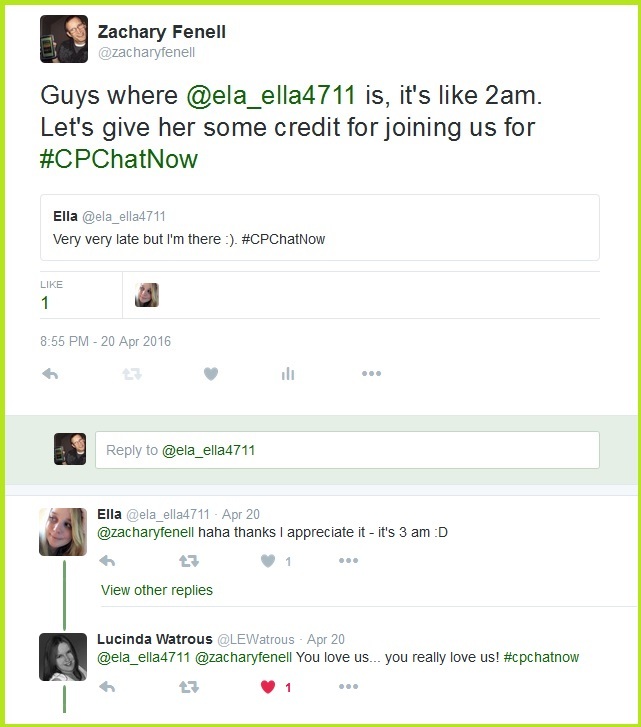 Like the CPChatNow Facebook fan page! 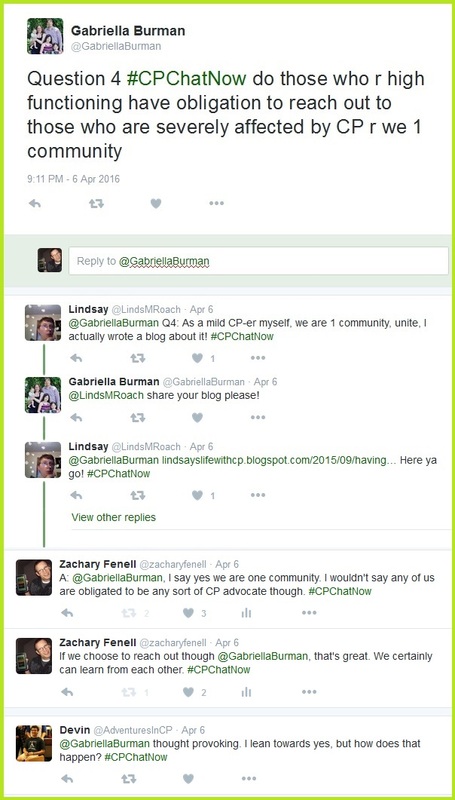 There we post cerebral palsy related articles daily. Finally, remember to answer the week’s extend-the-conversation question. Respond by leaving a comment below! Thanks for checking out the recap. P.S. To read the aforementioned sample from my memoir, just visit Off Balanced‘s Amazon sales page. 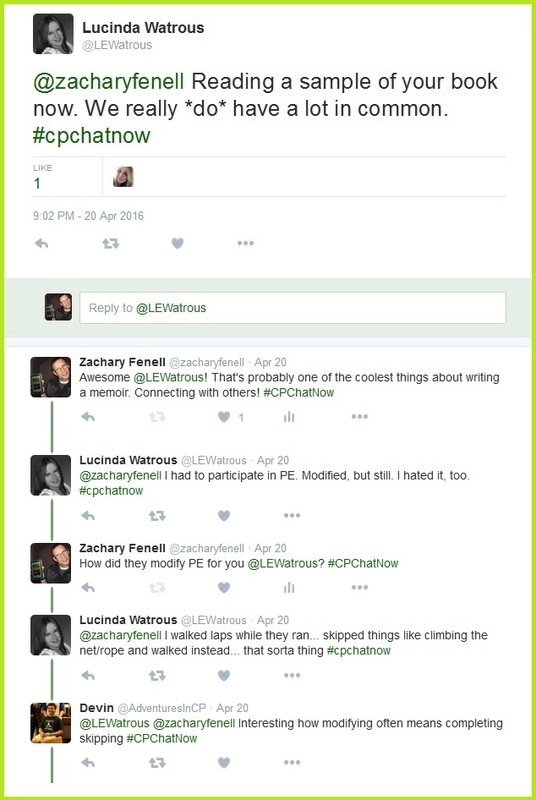 Inclusive education and advocating for accessibility remained the main topics discussed during the April 13th #CPChatNow. Hi! 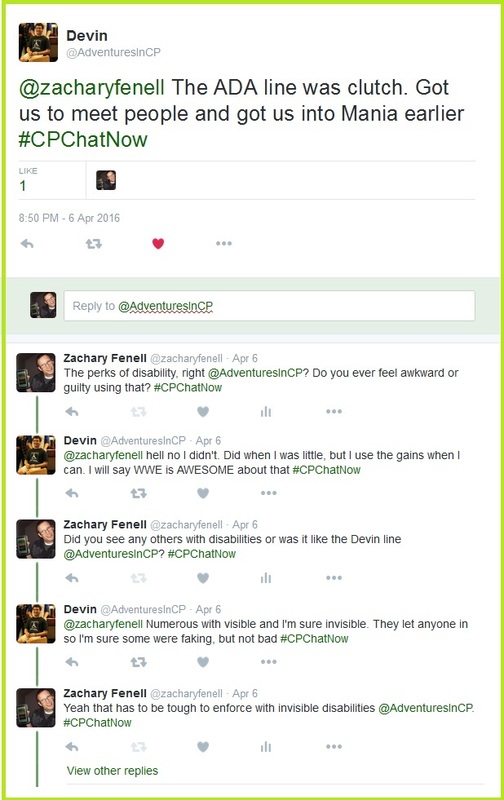 Delayed greetings again from co-host Zachary Fenell. At least by now you know to expect the weekly recap mere hours before the next chat. A pattern I plan to change very soon. Enough opening banter though! Let us look back at the prior week’s Twitter chat. I actually guest hosted a different Twitter chat the previous day. 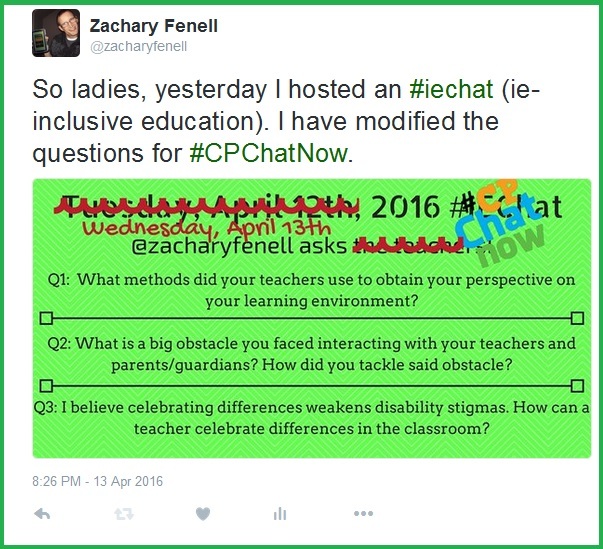 On Tuesday, April 12th I received the opportunity to ask teachers questions courtesy the inclusive education chat #iechat. 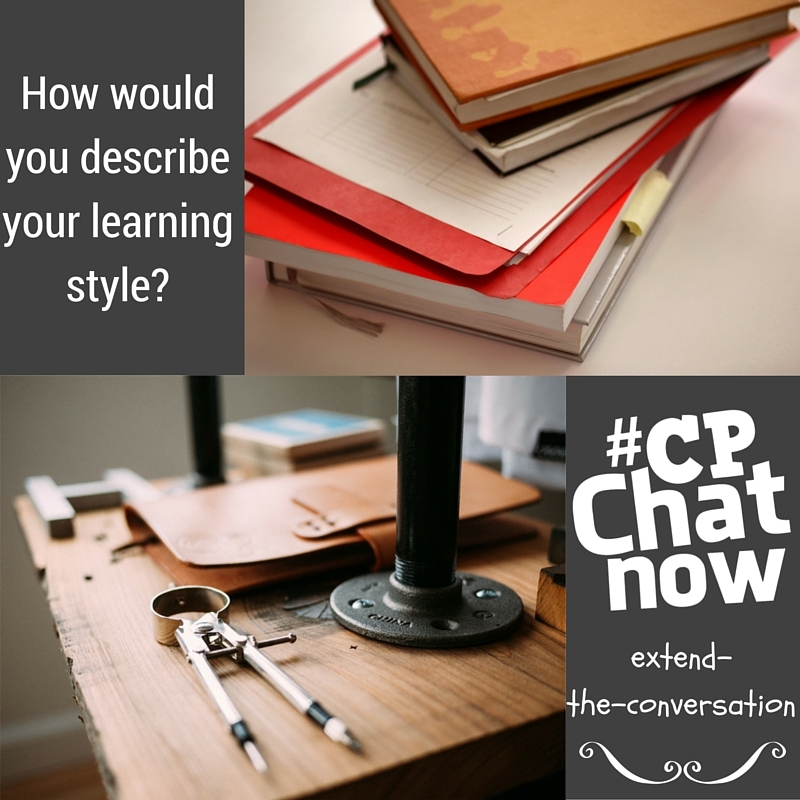 Afterwards I decided to re-phrase my questions so I could ask them during #CPChatNow too. The discussion led to reminiscing about old assistive technology no longer used. My co-host Blake Henry raised an important point when answering the third inclusive education question. 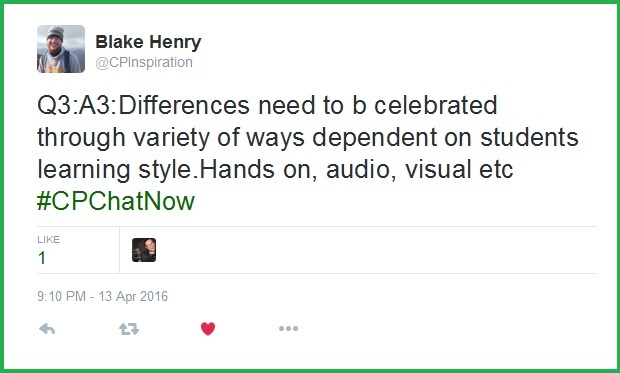 Blake’s comment transitions us to today’s extend-the-conversation question. “How would you describe your learning style?” Answer in the “Comments” section! Additionally, as noted earlier, advocating for accessibility grew to become a popular topic last Wednesday. Personally I think Hannah’s frustrating situation spotlights the importance for our community. She can come and vent to people who actually understand the situation. Plus we help each other out, aiming to create change. Ultimately we provide emotional support and practical advice. Quite the duo! Feel free to join in and reap our fruits. 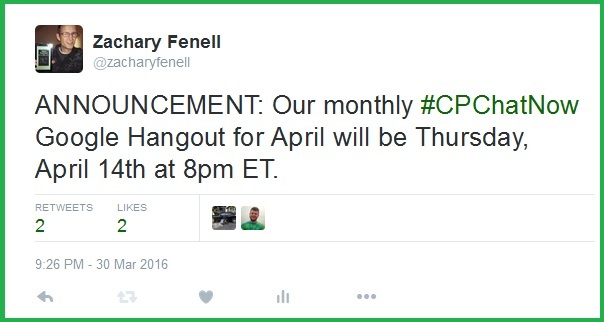 #CPChatNow takes place on Twitter every Wednesday starting at 8pm ET. For those not on Twitter, Blake and I continue to provide opportunities for you to participate in our community. We share cerebral palsy stories daily on our Facebook fan page. Like the page and interact with what we share! Join the conversation and answer in the “Comments” section! Again answer in the “Comments” section. 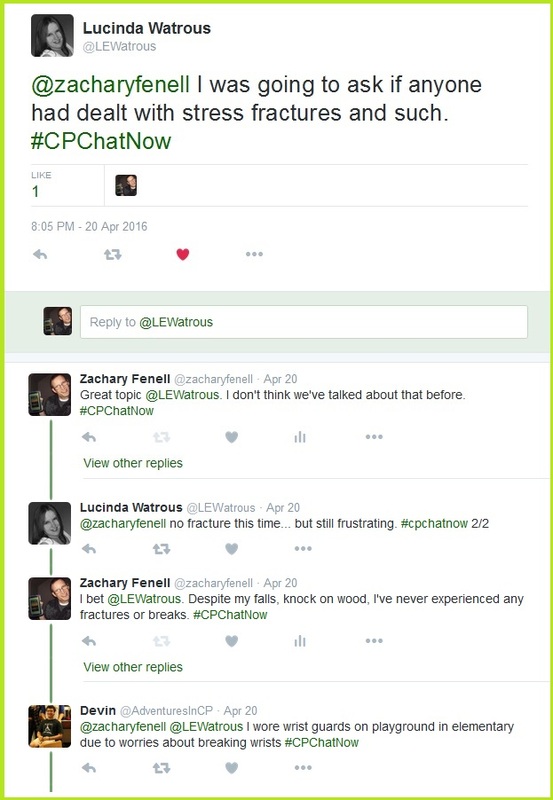 Cerebral palsy related wisdom, uniting as one community, and more surfaced during the April 6th, 2016 #CPChatNow Twitter chat. Before I get into summarizing mode though, I want to thank you for your patience. Lately I am failing to post these weekly recaps in a timely manner. This segues to other failures as well. Last month my co-host Blake Henry and I surprised our community by launching said website here. We possessed and still possess many hopes for the site. I looked forward to allowing others to post the weekly recaps. Shortly following the website launch an idea for a special “What’s Your Story?” blog post series emerged. Yet I’m still the lone ceep writing the recaps. There remains no progress on the “What’s Your Story?” series. Know all this weighs on me. While I cannot offer a time table for when these changes will start, I can say they will eventually start. So again, thank you for your patience. Now with that said, let us re-focus and revisit last week’s Twitter chat. 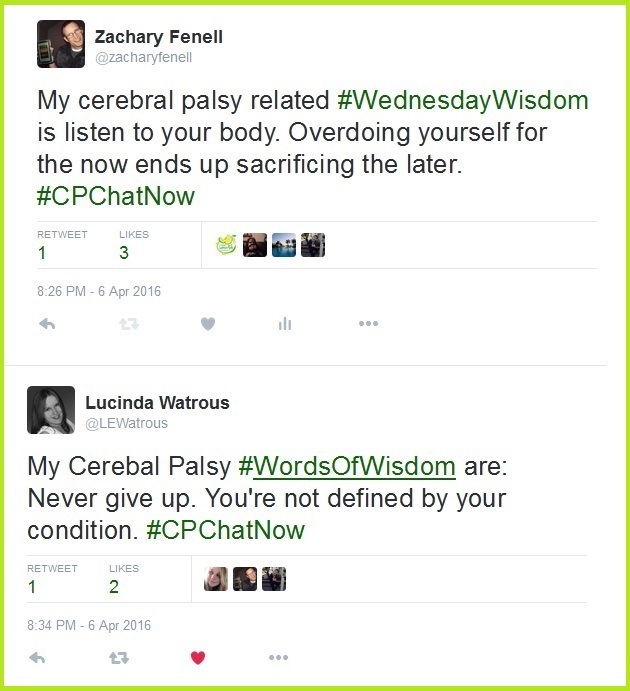 Seeing #WednesdayWisdom trending I decided to ask about cerebral palsy related wisdom. 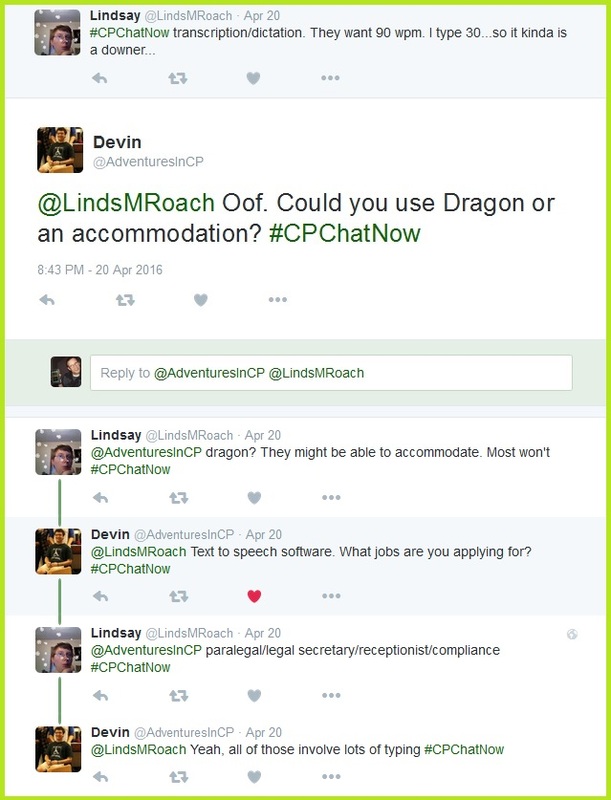 Another question asked dealt with the widely varying differences found in the overall CP community. Leave your answers in the “Comments” section. If you want to checkout Lindsay’s blog post on the topic prior to answering, click here. The variation in severity carries over into the entire disability community. A fact which emerged when discussing the ADA line at events. 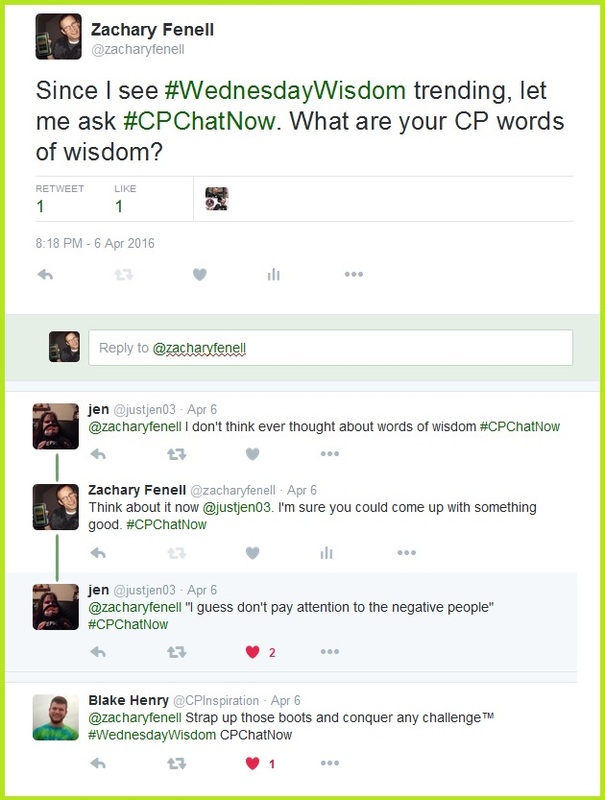 Well, judging by the time I should bring the April 6th, 2016 #CPChatNow recap to a close. I mean this week’s chat begins very shortly. Whether or not you can join the live chats on Twitter, you should contribute to the conversation. So go ahead and answer the extend-the-conversation question. Again answer by leaving a comment below. Thank you too for checking out the weekly recap! 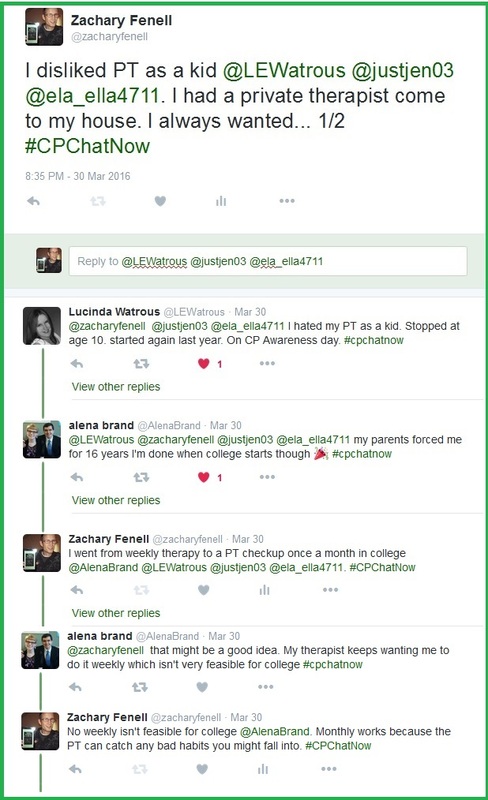 Yes, FINALLY a recap for the March 30th live cerebral palsy Twitter chat #CPChatNow! Zachary here to document last week’s exciting chat. Excitement I derailed by waiting a week to recap. Anyhow I’m here now and with me I brought highlights from the past week. The presence brought by chat newcomers sparked the aforementioned excitement. 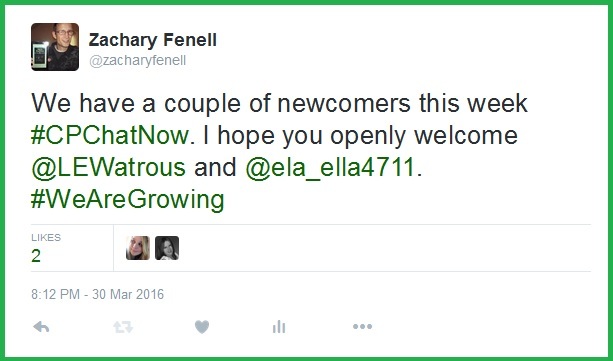 Amidst welcoming our newcomers by also introducing ourselves another newcomer joined the dialogue! I wish to emphasize, despite our CP distinction we are welcoming to all disabilities. Personally I’m always interested to learn how other disabilities compare with cerebral palsy. So please, join us sometime. Our conversation tends to grow naturally. For example, our introductions smoothly transitioned to another subject. Quickly physical therapy (PT) came to dominant the chat. All the above PT talk eases us into this week’s extend-the-conversation question. 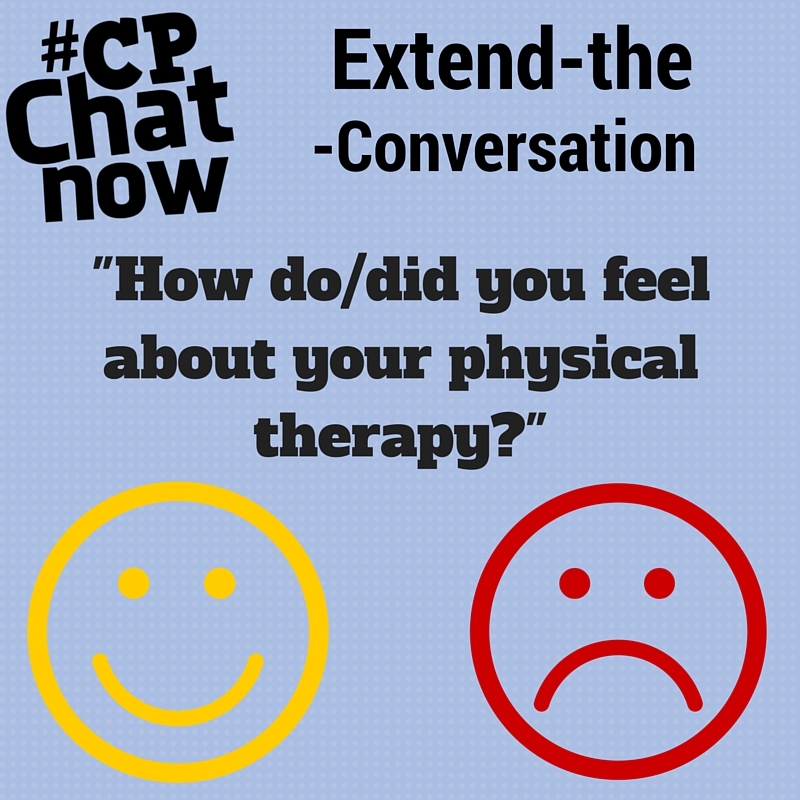 “How do/did you feel about your physical therapy?” Leave your answer in the “Comments” section. 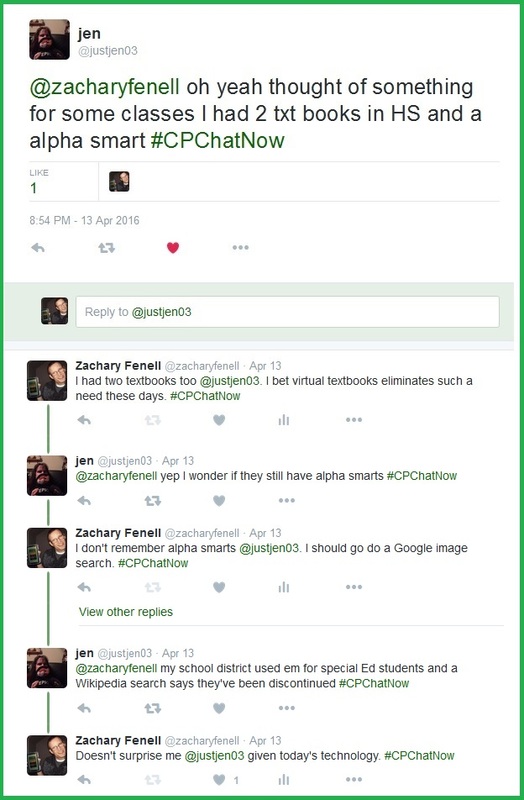 Moving on with the recap, I also announced details for April’s CPChatNow Google Hangout. Hangouts offer an opportunity to gather face to face without us all needing to travel to one spot. For safety reasons invites go out privately. Send me a direct message on Twitter for more information. Hopefully I will talk to you tonight during this week’s live Twitter chat. 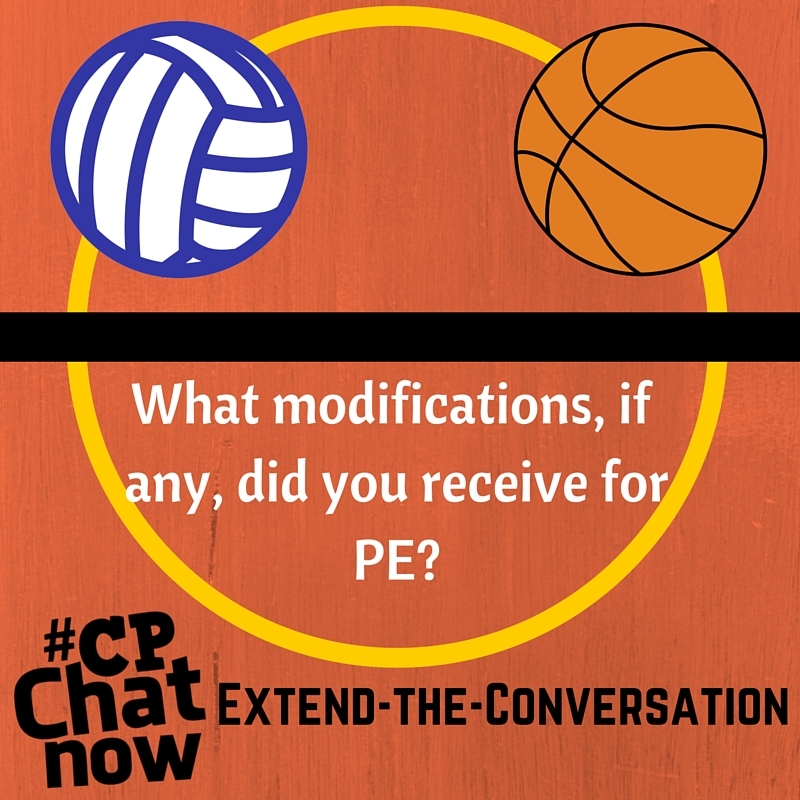 While you countdown to 8:00pm ET, go ahead and answer last week’s extend-the-conversation question.